THE UK’s new Conservative majority government is under pressure to make concessions to Scotland after an election result which saw the SNP take 56 of the 59 Scottish seats and forced the resignation of Labour leader Ed Miliband and Lib Dem boss Nick Clegg. The two men quit after David Cameron won an unexpected overall majority with 331 seats to Labour’s 232 and the Lib Dems’ eight. Shares surged after the surprise victory cheered the City and dispelled expectations of weeks of uncertainty. 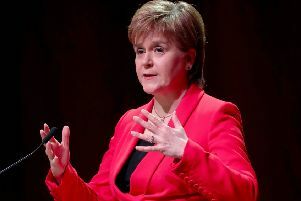 First Minister Nicola Sturgeon said Scotland had decisively voted against austerity and for an alternative approach. Ms Sturgeon’s party won 50 per cent of the votes cast in Scotland, compared to just 20 per cent in 2010. In comparison Labour saw its share of the vote fall to 24 per cent, with the Conservatives on just under 15 per cent in Scotland and the Lib Dems on 7.5 per cent. As the results came in Mr Salmond declared that the “Scottish lion has roared”. Ms Sturgeon said: “The political firmament, the tectonic plates in Scottish politics have shifted. What we are seeing is a historic watershed. “Scotland didn’t just vote in small numbers for a different party. Some of the swings we saw across Scotland were unprecedented in Westminster political history. “I briefly spoke to the Prime Minister and made it clear that it cannot be business as usual, the democratic will of the Scottish people as expressed in that election has to be recognised. “It was an opportunity for me to congratulate him. I didn’t want him to be Prime Minister again but he has won the election and I congratulated him. He was gracious to congratulate the SNP on our success. “We will meet as soon as possible and discuss these issues in more detail but I made it clear, it can’t be business as usual. Mr Cameron later said he would “stay true to my word” and implement plans for further devolution that have already been drawn up “as fast as I can”. He added: “Governing with respect means recognising that the different nations of our United Kingdom have their own governments as well as the United Kingdom government. “Both are important and indeed with our plans, the governments of these nations will become more powerful with wider responsibilities. Scottish Justice Secretary Michael Matheson said it was clear Scotland wanted a different approach from the other parts of the UK. He said the SNP would make sure the promises about more powers for Scotland were delivered and the UK government was held to account. London Mayor Boris Johnson, who was elected MP for Uxbridge and Ruislip South, said all parties must take account of the rise of the SNP in Scotland. “There has to be some sort of federal offer” in light of the huge increase in SNP MPs, he said. Scottish businessman Tom Hunter suggested David Cameron should appoint Alex Salmond as Scottish Secretary as a “useful gesture” towards the SNP. Mr Miliband quit as Labour leader after devastating results, which included the defeat of key figures Ed Balls, Douglas Alexander and Jim Murphy. He said he took “absolute and total responsibility” for the result. He said he was quitting immediately because the party needed to have “an open and honest debate about the right way forward, without constraint”. Candidates tipped to stand for the leadership include Andy Burnham, Yvette Cooper and Chuka Umunna. Scottish Labour leader Jim Murphy rejected calls for his resignation, arguing the party had been “overwhelmed by history and by circumstance”. He said the election campaign had been “the biggest challenge in our 127-year history”, coming in the wake of last year’s independence referendum and the SNP’s back-to-back victories at Holyrood in 2007 and 2011. But with the Scottish Labour leader now not holding elected office at either Holyrood or Westminster, questions will be asked about how long he can continue in the role. He was elected to the job just five months ago after his predecessor, Johann Lamont, quit, accusing the party in London of treating Scotland like a “branch office”. Senior figures from the Lib Dems were also ousted in the election’s Nationalist landslide, with Danny Alexander, who had been chief secretary to the Treasury, and former party leader Charles Kennedy both ejected from the Commons. David Mundell, who was Scotland’s only Conservative MP in 2010, is still the single Tory representative north of the Border. With some constituencies showing swings to the SNP of more than 30 per cent, Douglas Alexander, Labour’s election campaign chief and shadow foreign secretary, was the first big scalp of the night. Student Mhairi Black, 20, beat the former government minister in Paisley and Renfrewshire South to become the youngest MP in the House of Commons since 1667. Meanwhile, pollsters are facing an independent inquiry into their accuracy after almost every survey during the election campaign underestimated the Conservatives’ lead over Labour. The British Polling Council (BPC), which acts as the association for opinion pollsters, said it would look into the causes of the “apparent bias” and make recommendations for future polls. Political observers were shocked by the exit poll showing the Tories comfortably ahead of Labour as the largest party, which was then followed by David Cameron’s party winning an overall majority. In the run-up to polling day, almost every major national poll had predicted the race was neck and neck and too close to call.